Snownews is a lightweight RSS newsreader for console lovers. It lets you aggregate news from a variety of sources in one place in a very easy and quick way. Additionally, it comes with Slackware so there is a big chance that it is already installed on your system. 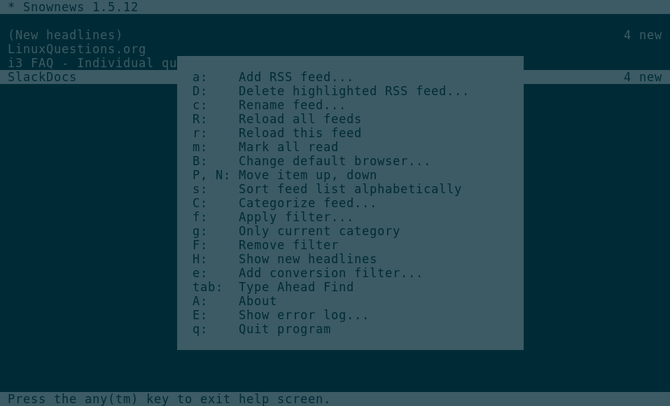 To start Snownews, simply type snownews in the console. Nowadays most websites provide RSS feeds. If there is a website that doesn't, you could try to employ scripts like script4rss to convert static HTML pages to feeds. It just switches on colour support. Assigning -1 to it would switch off colour support. Display new feeds in magenta. The feed title has no colour. The ~/.snownews/colors file contains other color definitions. To add a new feed, you need to press a. If you want to change it, simply replace a with a key of your choice. From now on, all URLs will open in Firefox. Snownews has a Christmas related Easter Egg. Simply create the santa_hunta file inside ~/.snownews/, open the About window by pressing A from the main screen and enjoy the game. List of other popular RSS newsreaders.